The National Science Foundation and the United Kingdom's National Environmental Research Council are the forces behind eight new initiatives in Antarctica to determine how quickly a massive glacier could collapse. Penn State is part of two of these projects, GHOST and MELT. GHOST — Geophysical Habitat of Subglacial Thwaites — will look at the sediment and bedrock underlying the Thwaites glacier. "The future picture of what the glacier will do is dependent on the bed," said Sridhar Anandakrishnan, professor of geosciences, Penn State and principal investigator for this five-year, $4 million grant. "We need to know if it is sediment or hard rock and whether it is rough or smooth. All these details make it easier to understand what the glacier's response will be over decades and centuries." The Thwaites glacier is part of the West Antarctic Ice Sheet and flows into the Amundsen Sea in the southern South Pacific Ocean. It has a relatively small ice shelf, so most of the ice is supported by land, meaning that any ice from the glacier that enters the water will add to sea-level rise. Ice shelves slow the progression of ice flowing into the oceans and protect the edge of the glacier from melting by ocean water. "Thwaites is a relatively slow-going glacier in the interior," said Anandakrishnan. "But at the terminus it can move at the rate of 2.5 miles per year." Researchers understand, in general, how glaciers move and ice shelves calve off, but they need to know the particulars of exactly what happens in this glacier. To find out, the researchers will use radar and seismic sensing to study the interface of the glacier and the rock and debris beneath. The Thwaites ice is a half-mile to a mile deep, so remote sensing, and particularly active sensing, are planned. For example, in active seismic sensing, sound is sent through the ice, and seismic sensors on the surface of the ice record the echo that returns. Once field data is collected, the researchers will model a variety of scenarios to see if Thwaites is likely to quickly run into the sea, causing more than three feet of sea-level rise, or destabilize over longer times. Anandakrishnan is also a co-principal investigator on the MELT project, which is aimed at investigating the interaction of the ocean on the small Thwaites ice shelf and the grounding zone — the area where the glacier leaves the ground and begins to float on the water. New York University's David Holland is the principal investigator on this project and researchers from the United Kingdom are also investigators. Over the next five years both projects will have field seasons to collect data. GHOST will be in the field during the southern hemisphere's summer in 2019 and 2020. The eight-project initiative on the Thwaites glacier will cost, over all, about $25 million, provided by the National Science Foundation and the National Environmental Research Council, U.K.
Other researchers on the GHOST project are Richard Alley, Evan Pugh Professor of Geosciences, Penn State; Leigh Stearns, associate professor of geology, University of Kansas; Knut Christianson, assistant professor of Earth and space sciences, University of Washington; and Lucas Zoet, assistant professor of glaciology and glacial geomorphology, University of Wisconsin. 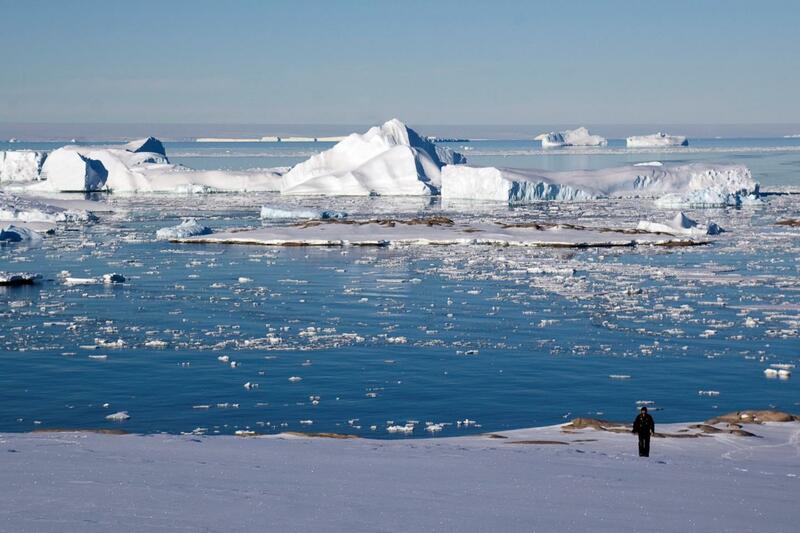 Other researchers on the MELT project include Eric Rignot, Donald Bren Professor of Earth System Science, University of California, Irvine; Britney Schmidt, assistant professor of Earth and atmospheric sciences, Georgia Tech; and John Paden, research faculty at the University of Kansas.